Among all the sports teams, athletes, leagues and federations present on social media, none has been successful as much as the NBA. 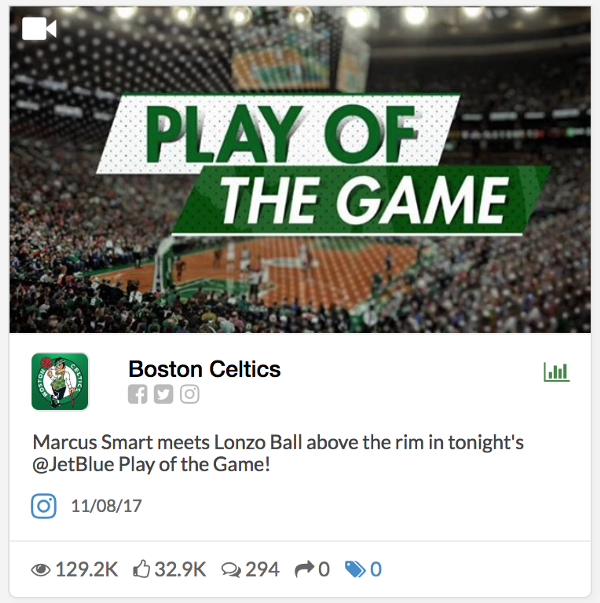 With over 7 billion interactions across its social channels, the NBA easily outranks the other big leagues in the United States. 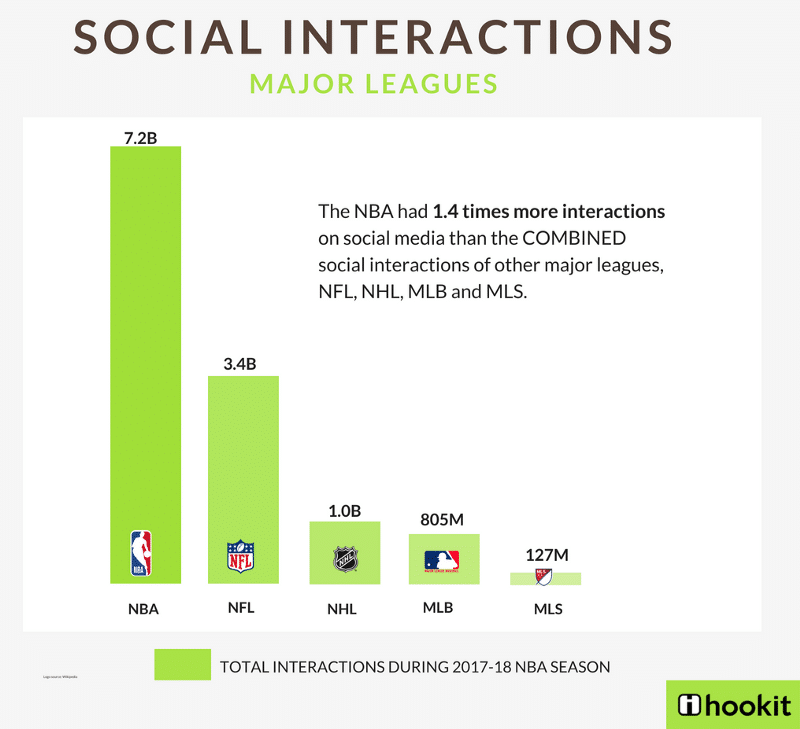 i.e, social media interactions of the NBA was 1.4 times more than the interactions of the NFL, NHL, MLB and MLS COMBINED. The NBA has been praised over the years for its successful implementation of social media practices and for being relevant with the younger, digitally savvy audiences that everyone in the sports ecosystem is trying to reach. “We promote the posting of our highlights. We analogize our strategy to snacks versus meals. If we provide those snacks to our fans on a free basis, they’re still going to want to eat meals — which are our games. There is no substitute for the live game experience. We believe that greater fan engagement through social media helps drive television ratings,” Adam Silver, NBA Commissioner. 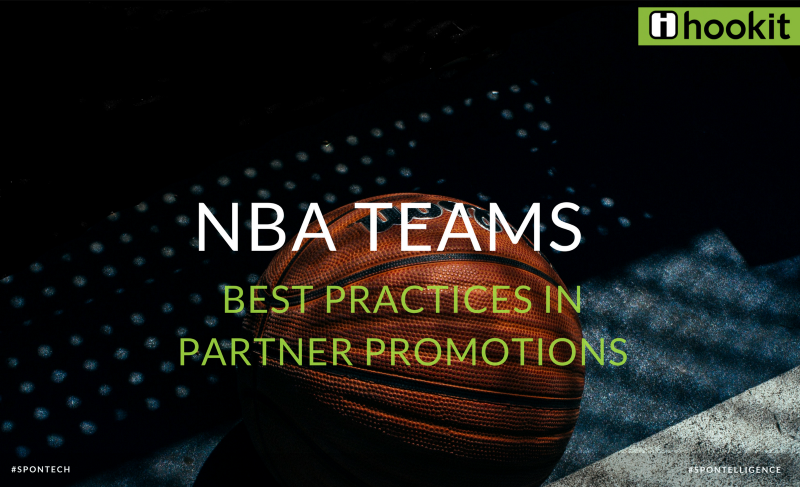 Now that the 2017–18 season is at an end with the Golden State Warriors as champions for the second consecutive year, here’s a look at the top 5 promotional campaigns across the NBA during the season that drove sponsorship value and ROI! With 34M followers across their social channels, the Lakers were the most followed team of the NBA. They had 1.2 times more followers compared to the Golden State Warriors, the second most followed team on social media. 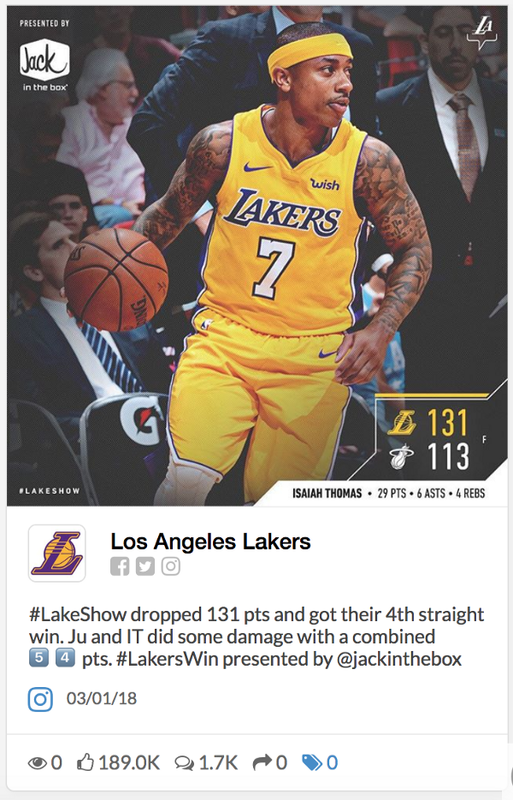 During the season, Lakers were one of the most successful at running social media campaigns for their sponsors. Long time Lakers sponsor Jack in the Box, is famously known for creating the taco frenzy during Lakers games since the 2006–07 season. (We want tacos anyone?) 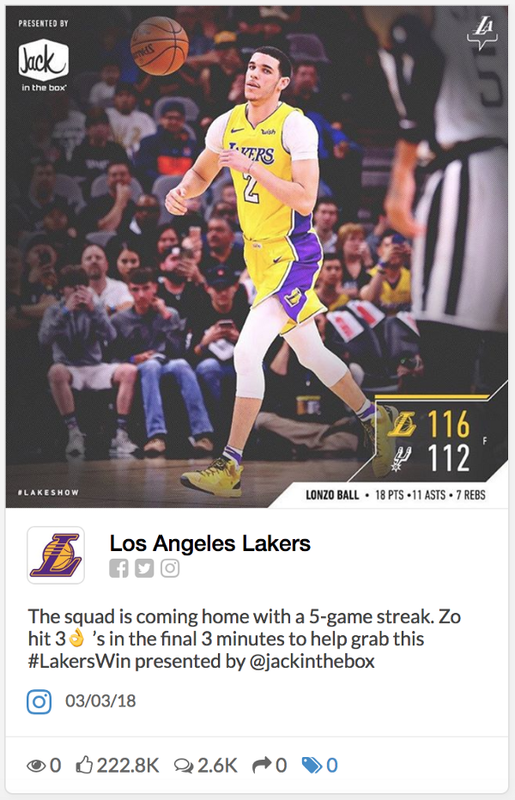 For the 2017–18 season, Lakers ran a weekly campaign on social media sponsored by Jack in the box, that highlighted the game winning moments of the Lakers. The campaign was run consistently every week and provided winning details, as well as the player who stood out during that particular game. The Jack in the Box logo was predominantly displayed on all the images and there was clear mention of the sponsor in social media posts. This promotion clearly linked the sponsor (Jack in the Box) with positive moments for the fans (winning & their favorite athletes) creating a favorable association of the sponsor. The 2017–18 NBA champions Golden State Warriors, are one of the most popular teams of the NBA on and off the field. With 26M followers across their social channels, they are the second most followed NBA team on social media behind the Lakers. With a jersey sponsorship of $20 million annually over three years, Rakuten is undoubtedly the Golden State Warriors biggest sponsor. Throughout the season, the Golden State Warriors ran a series of short stories, called Warrior Shorts presented by Rakuten. This campaign featured highlights and player/coach interviews and their take on what was happening at that point in the season. 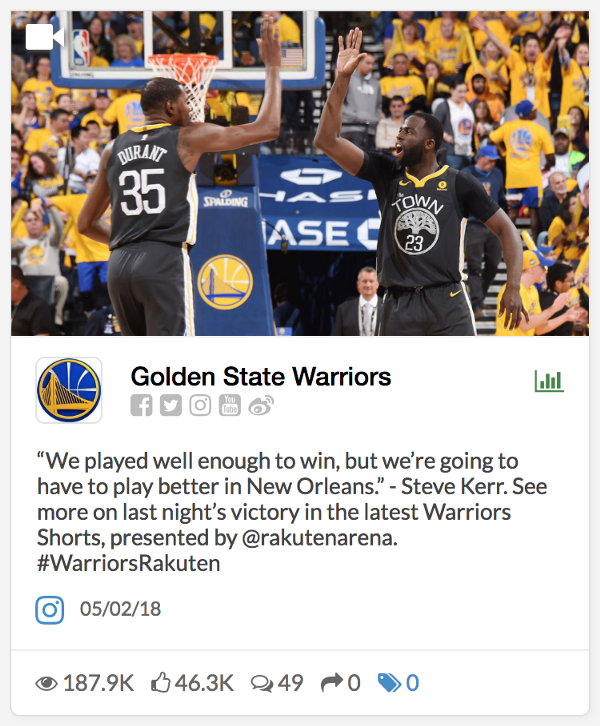 The campaign was run consistently throughout the season, and the Warriors social channels used the hashtag #WarriorsRakuten on their posts as well as clear logo placement during the beginning of the videos. This series resulted in great exposure for the Rakuten brand in the US off the court. The winner of 6 NBA championships, the Bulls are credited with popularizing the NBA worldwide during the 90’s. 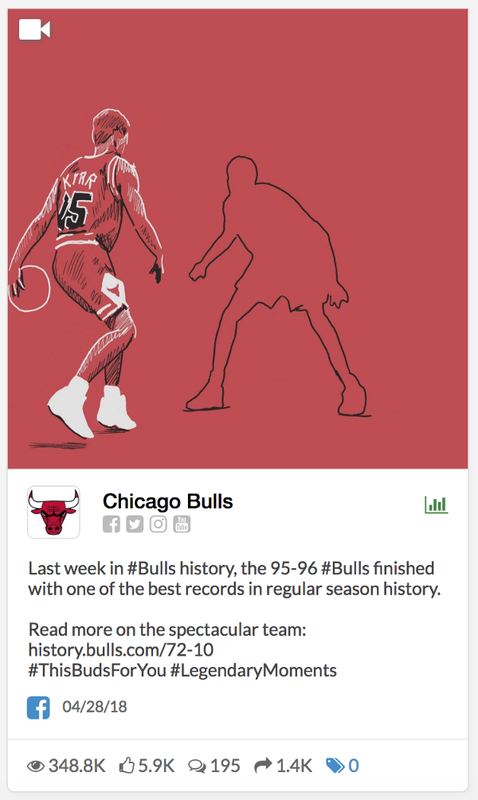 On social media, they are the third most popular team with 26M followers across their social channels (in comparison, the Warriors, who are the second most popular team on social media, only have 30k more followers than the Bulls). 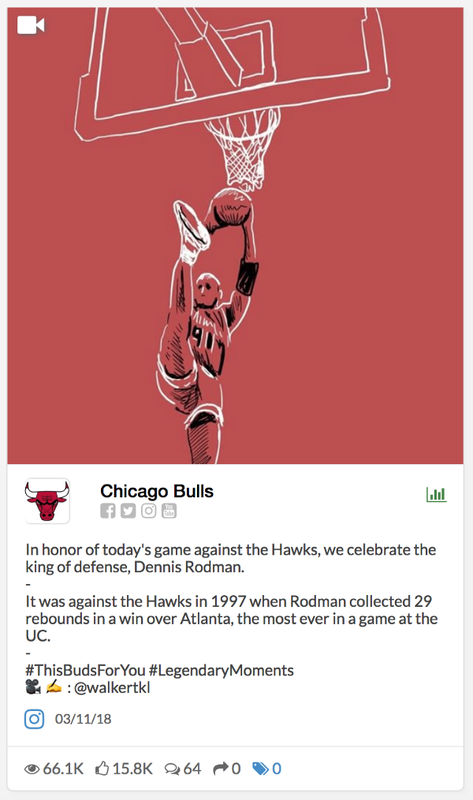 Every week during the season, the Chicago Bulls shared a video that highlighted a legendary moment of the Bulls on their social channels. The video is stenciled and the events are drawn out throughout the video. The video then replicates what happened at that legendary moment through animated short videos and illustrations. The Bulls took a unique approach in presenting the videos as illustrated animations rather than the actual footage, making them more catchy and engaging. Also, clear logo placement of Budweiser and sponsor mentions on social posts resulted in increased exposure and awareness for Budweiser. With 17 championships to their name, the Boston Celtics are one of the most successful franchises of the NBA. 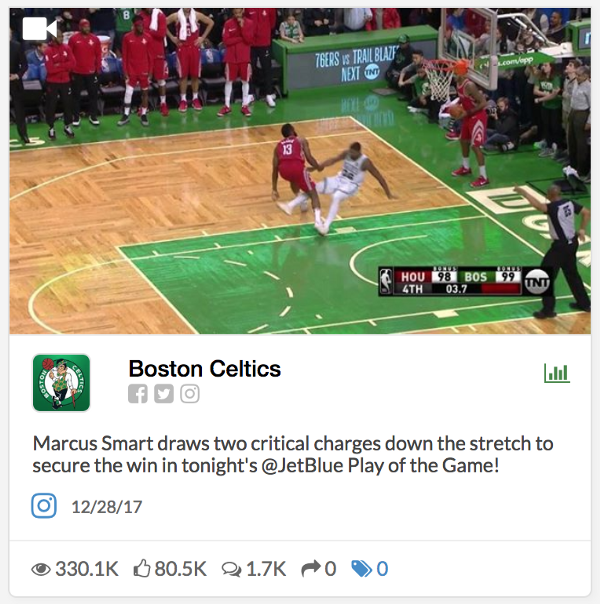 During the 2017–18 season, with 315M interactions across their social channels, the Celtics had the third highest social media interactions among the NBA teams. At the end of every game, the Celtics posted the JetBlue Play of the Game. This highlighted a game changing play, an incredible dunk or the player of the game. This campaign can easily be considered the most successful campaign on social media for a sponsor. Social posts of this campaign generated huge engagement, with positive fan comments and feedback. The video prominently features the sponsor logo at its start and the posts all feature mentions of JetBlue. Fans that were not able to make the game could still catch the highlights thanks to JetBlue, creating a positive association with the brand and their favorite team. Though they may lost the championship this season, the Cleveland Cavaliers took the top spot on social media. With 729M interactions across their social channels during the season, the Cavaliers had the highest number of interactions among the 32 teams. 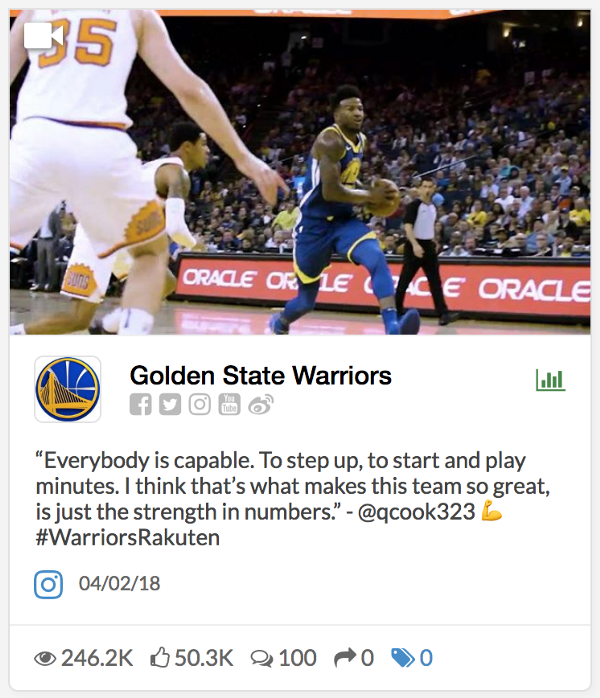 They also had an engagement rate of 6.7%, making them one of the most engaged teams on social media (in comparison, the Warriors had an engagement rate of 1.1% ). 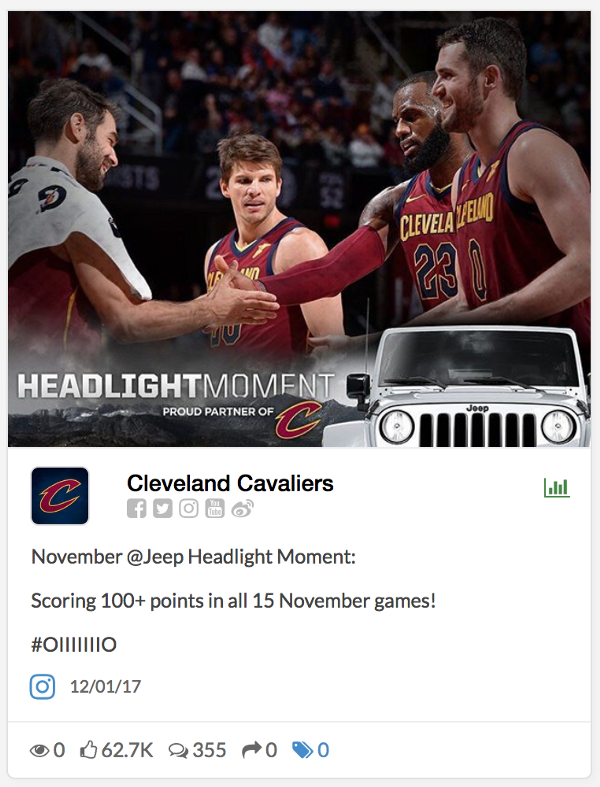 Jeep: The Cavaliers ran two main campaigns for their sponsor Jeep — Jeep Headlight Moment and Jeep Infographic. 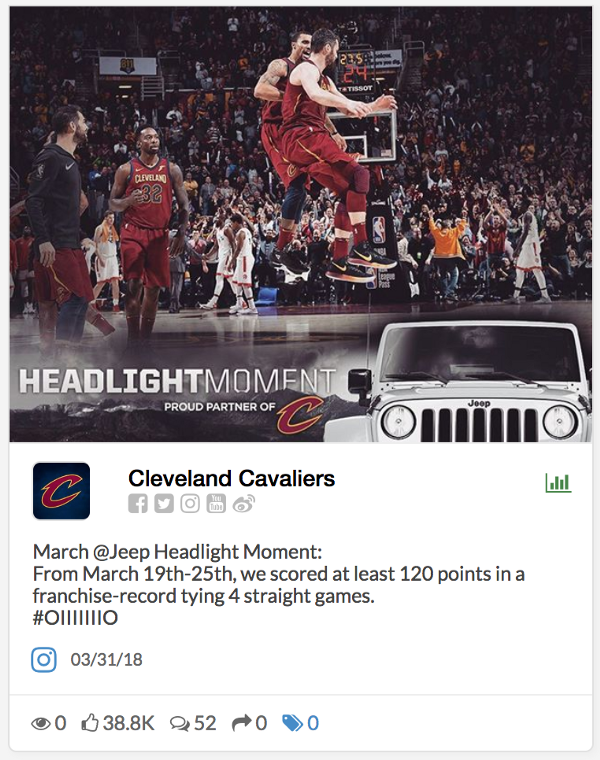 Over the course of the season, the Cavaliers ran a monthly campaign called Jeep Headlight Moment, that highlighted performances, important moments and key players. 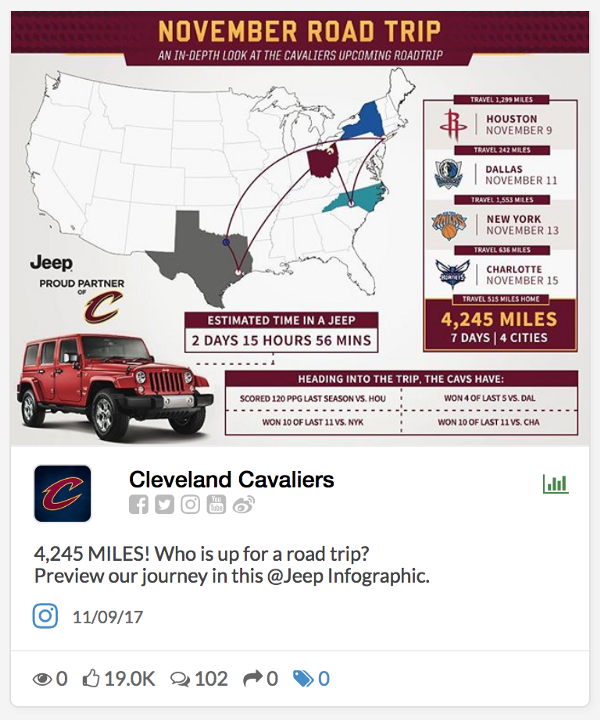 Within every post, the Cavaliers did a great job in promoting Jeep. Instead of a Jeep logo, a small image of the Jeep car is present on the posts which is unique and appealing. 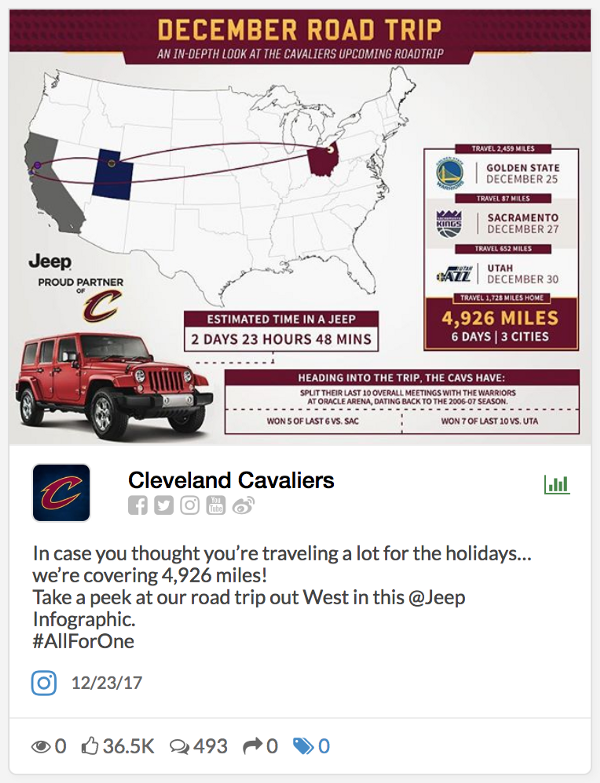 The monthly campaign incorporated posts that showed interesting stats about the Cavs before heading into their next trip, along with the estimated time/miles that will be needed to complete the same trip as the Cavs in a Jeep. The campaign was unique and presented interesting stats, which was different from other social media campaigns. For example, the post below showed the Cavaliers November road trip. The infographic showed the length and time of travel (traveled 4,245 miles over the course of 7 days) and the number of stops (four cities). It then summed up how long the road trip would take in a Jeep if traveling the same route as the team. These posts were interesting and different from the norm, and showcased Jeep as a vehicle of choice for anyone undertaking a road trip. Although the Top 5 campaigns with the highest sponsorship value and ROI featured different sponsors and teams, there were certain similarities which made them the best. Consistency — whether weekly or monthly or at fixed intervals, the campaigns were run consistently across the team’s social channels, making them a constant fixture that fans can look forward to. Logo placement and sponsor mentions — Dominant logo placements and mentions of the presenting sponsor reinforced the sponsor name to fans leading to increased brand awareness and brand recall. Creativity — Each campaign was unique in its own way and appealed to the fans. The creative approach of the campaigns broke through the clutter of thousands of social media posts and made the sponsor stand out among them. Positive sentiment — The sponsor campaigns had a positive sentiment attached to them, be it highlighting winning moments or sharing inspiring stories, the campaigns created positive associations between the fans and sponsors. Do you remember any other promotional campaigns by NBA teams that stood out to you? Sound off in the comments below! Are you a rights holder looking for ways to prove your $$ worth and impact to sponsors? Download the handy Spontelligence guide below!